Gluten Free, Dairy Free, Sugar Free, Oil Free Pumpkin Bread! Preheat oven to 350 degrees F. Grease a large loaf pan and fill about 3/4th of the way since it will rise. I prefer to use muffin tins, it cuts the time in half and they cook better! Combine pumpkin, eggs, apple sauce, water, vanilla and agave until well blended. In a large bowl, whisk together the flour, baking soda, salt, and pumpkin pie spice until well combined. Bake in preheated oven for 60-70 minutes (loaf pan), 30 minutes (muffin pan), or until a toothpick inserted in the center comes out clean. **The reason the water and agave measurements are weird, is because the original recipe called for sugar and more water, but since Agave measures 2/3 cups for every 1 cup of sugar and you have to lessen the water because of the consistency... these are the measurements that come out of it! "a way to communicate what WE are experiencing"
I am really enjoying being a part of new businesses and sharing the talents and hard-work of the Madden Family. It's a pretty joyful time of my life! Summer has been visiting over the last few days and it has been absofruitly wonderful! I have a drawer at work that I have made my "sunny day drawer" it has a blanket, shorts, and a tank. When it is sunny, I don't play games! You can bet your bottom dollar that I will put in overtime to take my full lunch- in the sun, at the park. 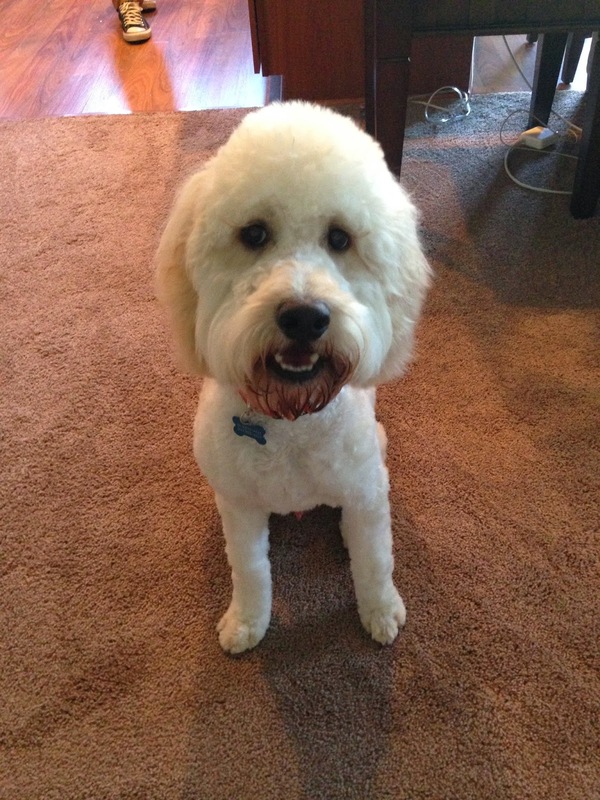 On another note, Rudy was groomed for the first time and he came out looking like a prissy, girl poodle! It was really funny at first, until I got in the car and realized how bad it was, and then I think I discovered depression for a couple of days. I am not even kidding, I cried. We actually decided to clip him ourselves to even out his coat, so he didn't look so silly. It was really bad... Just know, he looks much better now (this is before we fixed his head! ), but I will be missing that long hair for the next few months!